Eritrean Zersenay Tadese followed through with his promise to chase Sammy Wanjiru's world half marathon record, shaving 10 seconds off the Kenyan's time on the record-legal course in Lisbon - winning by almost 2 minutes. *Zersenay Tadese Nabs 2 World Records From Wanjiru And Gebrselassie Not only did Gebrselassie have a bad day in New York, he also lost his world 20km road record by almost 30 seconds to Eritrea's Tadese, who covered 20km in 55:21. 2005 World 10,000m Medalist Moses Mosop Debuts At 59:20 For Half Marathon That's quite the debut time. Article in Italian. Seoul Marathon: Sylvester Teimet Wins in Close 2:06 Battle Sylvester Teimet won in 2:06:49 as Gilbert Kipruto Kirwa was 10 seconds back. Amane Gobena won in 2:24:13 on the women's side. Wesley Korir Repeats In L.A. But Edna Kiplagat Steals $100,000 Gender Battle Prize Kiplagat, 30, is a very talented runner, but her marathon PB was only 2:50 coming into this race. Her win in this non-drug-tested race ends an 11-year streak by Russian women. Korir's run was again inspiring as he overcame an East-African pack to remain the King of L.A. while on his honeymoon, no less. Oregon Preview Quotes From Ducks We're wondering if Oregon would have won indoors with Matt Centrowitz, Jr.? *Oregon Preview Results The outdoor season is here. *Boards: Mathew Centrowitz Victorious in outdoor return @ Oregon Preview 3:48 win for Centro, Jr.
Oregon's Zoe Buckman 4:12 OTC's Sally Kipyego opened in 4:10 for 1,500. McNamara 7:53.63 Jordan McNamara keeps getting better. *Legitimate World Record Talk: Zersenay Tadese Going For Wanjiru's HM Mark In Lisbon Eritrean Zersenay Tadese is the king of the half marathon (4-time world champion) and probably the most talented male runner out there - 10k and up - besides Haile Gebrselassie, Kenenisa Bekele and Sammy Wanjiru. *LRC 2009 World Half Marathon Photos Tadese won yet again and Dathan Ritzenhein was 3rd. *Less Likely WR: Micah Kogo ran 27:27 in Laredo, ESP and missed his road 10km WR of 27:01. *Seoul Marathon Preview - Watch For 2:06 19-Year-Old Ethiopian Bazo Worku And Frankfurt Champ Gilbert Kirwa There might be some real fireworks in Seoul if these two guys are on top of their game. *Japan Running News Previews Rome Marathon Rome race organizers have chosen to honor the 50th anniversary of Abebe Bikila's 1960 Olympic Marathon win in Rome - a marathon he ran in bare feet. 2015 World Track Championships Will Be In London, Poland Or Beijing 2011 is in Daegu, 2013 in Moscow. Vote for your 2015 preference to the right. 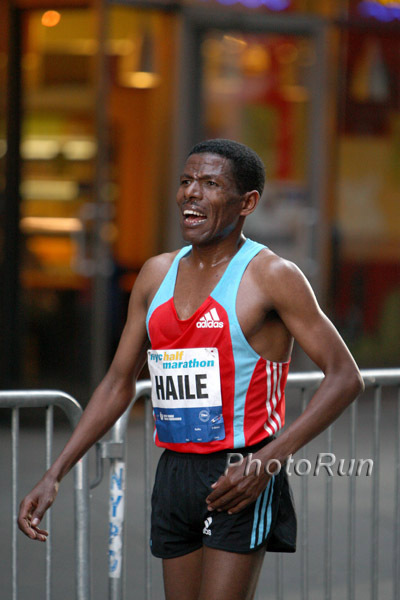 Haile Gebrselassie Says Asthma Ended His Day Early He slept wrong in Dubai. The air was bad in New York. Can Geb still run with the best in the sport? *LRC Photos See Gebrselassie on the side of the road - plus shots of all the action in the race full of interesting characters. *Deena Kastor Says She's Happy With Her Effort ... Despite getting passed at the end. She flew through 10km in 32:30 and will face Mara Yamauchi again at Virgin London. Favorites Fall In Dramatic Fashion In New York The Haile Gebrselassie coronation did not go as planned, as he inexplicably pulled off the course while running with eventual race winner Peter Kamais in mile 8. Deena Kastor built a huge lead in the women's race, running on course record pace, before being reeled in by a determined Mara Yamauchi. Runner Takes Off His Shoes, Sprints Across Rome Marathon Finish Line In Tribute 50 years after pioneering Ethiopian Abebe Bikila won the 1960 Olympic Marathon in Rome, Ethiopian Siraj Gena removed his shoes 500m from the line and sprinted across in 1st place barefoot in 2:08:39. According to the AP article, Gena outsprinted 2 Kenyans to the line. *Boards: Rome offers 5000 euro bonus for barefoot finish We were much more excited about the tribute before we saw this. Athletics Kenya Track Meet Can't Host Steeple, Pole Vault, Hammer And Other Events Because Of Vandalism And Lack Of Water We complain about a lack of money in the sport, but look what Kenyan runners do without having the funds to host a track meet on a decent track. Londoners are fighting over the Olympic track stadium, which apparently costs about $750,000,000 (see below). Recommended Read: Interview With Triple Jump World Champ And World Record Holder Teddy Tamgho We like 20-year-old Tamgho. Seb Coe Stands Up To Soccer Manager And Says Olympic Track Stadium Will Retain The Track Post-Games We're wondering how and why the stadium, which will be used basically for one event and then they'll tear about 60,000 seats out of it, cost $750,000,000. The money involved in the Olympics is outrageous. Brief Chat With Jason Lehmkuhle Team USA Minnesotan Jason Lehmkuhle says he can run 2:11 in Boston. Headlining American entrants Ryan Hall and Meb Keflezighi are really flying under the radar as Boston is now 1 month away. Polish National Women Take Nearly Half An Hour To Run Muddy, Snowy 8km World XC Course The best women's XC runners in Poland could barely cover the course that will be used for Worlds in under 6:00/mile. US World XC Team Officially Announced With Dathan Ritzenhein out, the only realistic US chance for a medal lies with Shalane Flanagan. Check out the rest of the senior and junior teams, as it's a significant accomplishment for all of those folks. Miguel Sánchez was one of the "Disappeared" Argentinians, a silent victim of a violent political climate in 1978. Sanchez, a nationally-respected athlete/poet, is celebrated by races that remember his death at the hands of political violence. Writer Pat Butcher reproduces a poem by Sanchez titled Para vos atleta - or, in English: For You Athlete. An artful read. Sad News: UCLA Olympic Medalist Wayne Collett Dies At Age 60 Cancer took Collett's life. Article On Walk On Redshirt Freshman Andy Bayer Of Indiana University Bayer has gone from a walk-on to 3rd place at the NCAA D1 indoor 3,000 by his redshirt freshman year. Do Any Videos Of Henry Rono Exist? Thanks to a couple of LRC visitors, you can now watch Henry Rono races from 30 years ago on YouTube in some of the most amazing running performances you will ever see.